If you have heard the phrase “necessity is the mother of invention“, it will be easy to understand how technology has already catapulted us into the future. Humans have reached the point where every single person on the planet has the capacity to become an imagineer. I am one and have been one for several years. As an intellectually normal person in a body that does not comply with the needs of a modern society, even twenty years ago I would have come unstuck in everyday life. Big tech and the trimmings that come with it have “imagineered” my existence into one of relative normalcy so much so that few notice that I am any different. The advent of both augmented reality and virtual reality has changed the lives of those with disabilities irreversibly. The technology that has made my life possible is often overlooked by the able bodied as something distant. What I use everyday to get through life, however, also enhances the lives of those that don’t have to address the challenges that I do. Augmented reality has been the game changer for the disabled and my life story illustrates exactly how. Pokemon Go has arguably been one of the greatest influencers in how AR has been introduced to the world. A lot of us understand AR to be an enhancement of how we enjoy the world that we already know. While gaming and entertainment with the integration of augmented reality has certainly improved our experience, sometimes our view of it is a bit unbalanced. Virtual and augmented reality is often considered to be accessible visually and audibly. For the disabled it is often used in an either/or situation as well as a combined experience. My life is made possible by voice activated software. Almost everything I do short of breathing is controlled by computers. This piece has been written using voice activated software. In fact, I read and respond to my email using voice. I switch on my television, adjust the heating, turn the lights on and off and control the hot water provision in my home, all by using my voice. This is real. This is augmented reality. With my voice, I can browse the internet, read the latest novel and call my mother who lives 6000 miles away. I do not have to press a single button. While all of this takes place, I can see on a screen, the information that is needed for those voice commands. My laptop, tablet, smartphone and PC all read text back to me when I am working. I instruct my devices to find information for me either onscreen or online without having to touch them. Augmented reality means that I can both see and hear what is happening in the present, what has happened in the recent past and will happen in the immediate future in my own environment. And I have control over it. Helplessness is a word that no longer exists in my vocabulary. The rapid evolution of this tech means that every week something new lands on my desk that I would love to try. Amazon is rapidly becoming a leader in the integration of AR into our everyday lives. Alexa has become one of my best friends. I can even turn the lights and heating on at home while I am several hundred miles away. AR means that I can take and answer calls, do the vacuuming in my home and listen to my favourite music artist, all by simple command. It also means that when I have had a seizure or feel one is about to take place, I can call for help immediately without having to press an emergency button around my neck. I simply instruct Alexa to make the call. Augmented reality has advanced to the point that the back door unlocks for the dog to let himself out when he barks. The next big thing to influence my life will almost certainly be the Vuzix glasses. I am writer and web developer. Augmented reality and the software development surrounding it means that I can make a living and for the most part run my own home and life. Voice and visual software enables me to shop online, manage my finances, make appointments. A few short years ago all the tech that makes my life easy was only in the pipeline and would have been way too expensive even to make me a productive member of society. Fifty years ago, I would have been institutionalized. Twenty years ago, I would have been placed in sheltered living. Today, I live a full life with my own home, friends, social life and of course my dog. Apart from the physical challenges I live with daily, I have to be careful with screens and their refresh rate, because I have refractory epilepsy. I use touch screens to speed things up and augmented reality on the screen means that I now do many things a lot faster than those that do not use this tech. It is remotely possible that my disabilities have forced discovery of my own capacity that places me at an advantage. Virtual reality has a place in my world too. 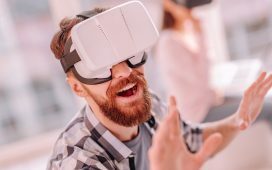 Apart from the gaming and entertainment world which is now accessible by those of us that have mobility problems, VR offers training possibilities too. VR means that with voice recognition and activation I can learn new things every day. I can experience the world that was out of my reach a few short years ago. With VR the disabled can climb mountains, surf the oceans, fly planes and drive cars. And very soon my imagineer brain tells me – augmented reality will make this possible too. Software is already controlled by eye movement and facial expression. The self driving car is no longer a fantasy. Is it worth it? The cost of the tech is between two and five percent of my annual income. And as the tech develops it gets more affordable. There are other questions that will be asked too. Is AR and VR going to turn the human race into a bunch of couch potatoes? I don’t think so. While it is possible, the availability of this tech has created a gap that will more than likely be filled with both virtual and augmented reality experiences that will keep us fit in mind, body and soul. The evolution and implementation of AR and VR has completely changed the definition of ability and capacity. Imagine where it will have taken us in 20, 30 or 50 years’ time. See Also: What Is the Difference between Virtual Reality and Augmented Reality? Ruth is a digital strategist, web developer and copywriter. She lives in Brecon, a small town in the Welsh countryside with her dog and trusted assistant, Kelev. Born in South Africa of a British father and a South African mother, she has lived in Israel and across the UK in England, Scotland and Wales. She has an undergraduate degree in psychology, a national Diploma in applied arts and a diploma in web development. Mother to three adult children and grandmother to two, she is also an amateur photographer. The implementation of technology to manage Epilepsy, Osteoarthritis and Bilateral inflammatory Polyarthralgia means that her life is as exciting and as much fun as anyone else’s. Her current job didn’t exist even when she graduated. Unfortunately she has to submit tax returns too.